I‘ve been deep diving into my British heritage lately, staying up late on those ancestry websites, and tracing the Wimbush name back for centuries. The names of my paternal grandmother ‘greats’ fascinate me – Bridget, Mary, Clara, Edith – so very proper and lovely. I’ve also come across a few very interesting last names in my expanded family tree; names like ‘Middleton’ and ‘Townsend’, which, if you follow the Royal family or watch The Crown, may ring a bell. With half of my heritage so firmly rooted in Great Britain, it’s no surprise that I am closely following the details for Prince Harry and Meghan’s upcoming wedding. 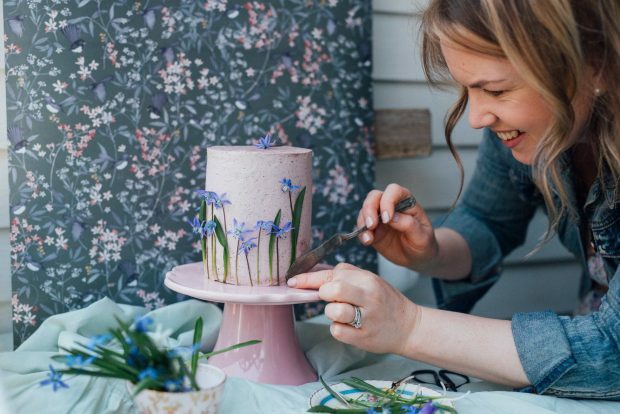 Today’s recipe is a mini wedding cake in honour of their union. 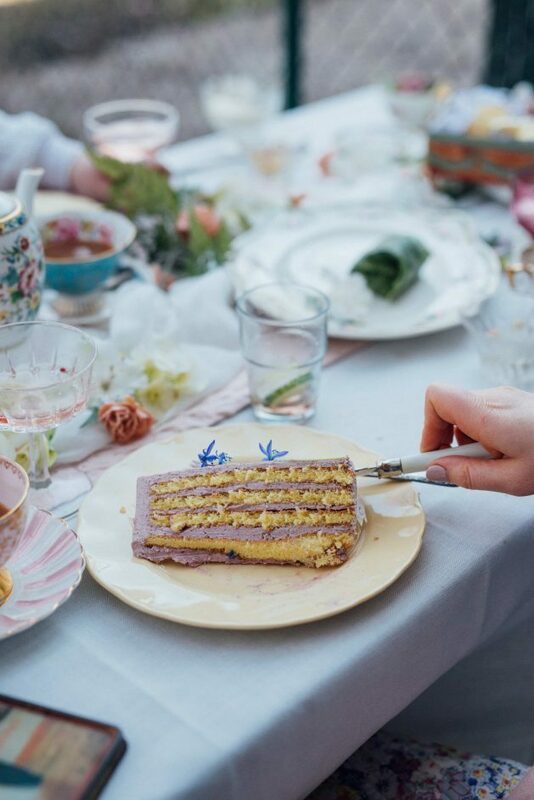 It’s a light-as-a-feather lemon sponge cake, layered (vertically!) 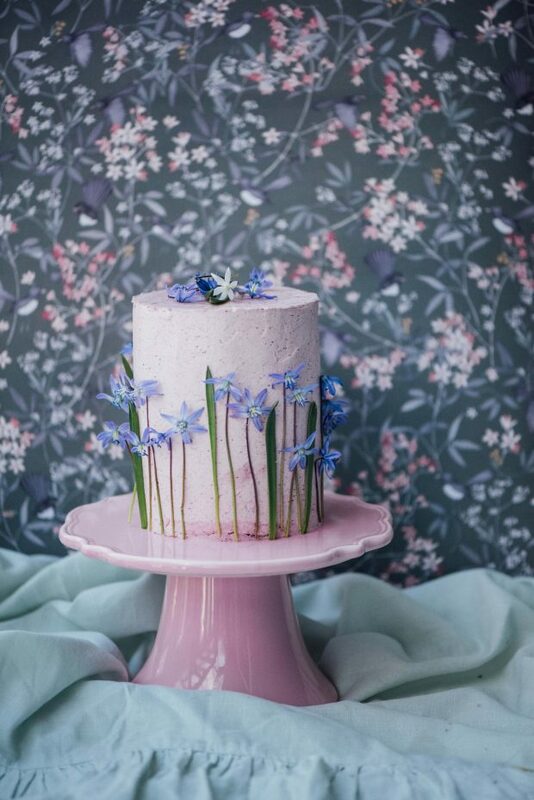 with a decadent berry buttercream and adorned with the first spring wildflowers. 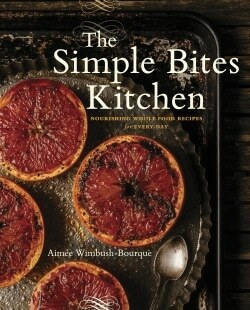 Read on for the recipe, the inspiration, the occasion and loads of photos. Since Harry and Meghan’s wedding happens to fall on my own wedding anniversary to Danny (’tis true! 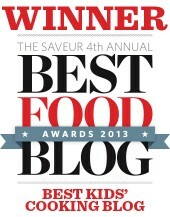 ), I knew we had to celebrate with cake…and not just any cake. Ever since I read through my copy of Sweet by Yotam Ottolenghi and Helen Goh, I’ve wanted to try their Lemon Blackcurrant Stripe Cake. 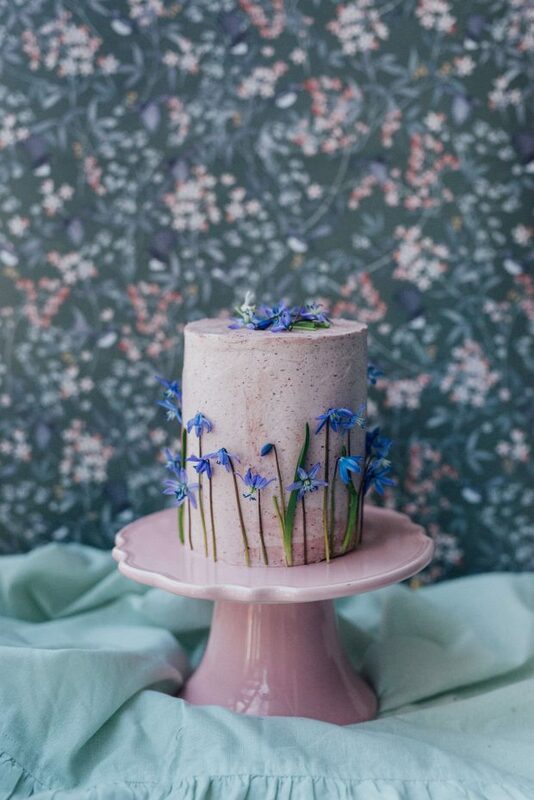 Something about the soft petal pink frosting drew me in and those stunning interior stripes presented a challenge I had yet to master as a baker. And the fact that this cake was created in London…well, it felt meant to be. I made this cake from start to finish, twice. Once for an afternoon tea with friends (and these photos) and again for Mother’s Day with family. I’ve got a few slices stashed in the freezer for Saturday, when we will be eating wedding cake along with the Royal wedding guests as well as toasting our own anniversary. The whole cake process went much faster the second time around. I knew the recipe was going to be a smashing success, and I worked with confidence. It is a bit of a long process, starting with the fruit puree and finishing with the buttercream, but it is broken down into manageable steps and a very well written recipe. 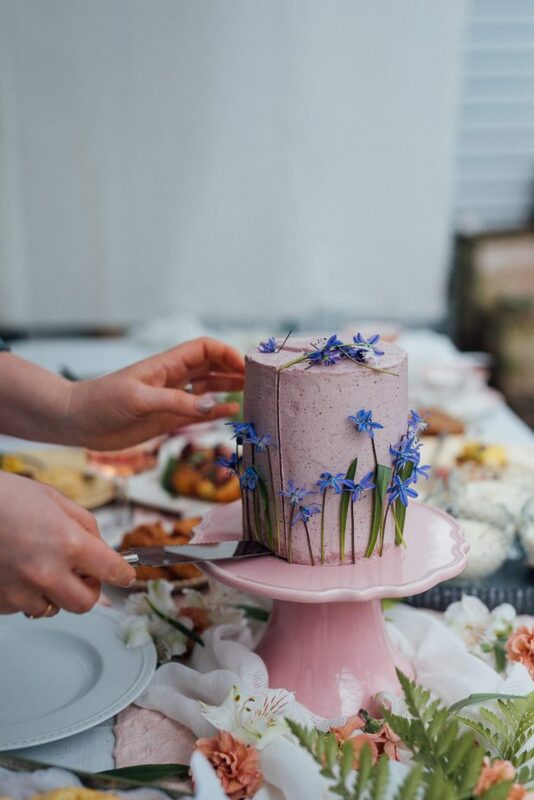 The morning I planned to serve this cake (more details on our afternoon tea party below), I headed to check on a little patch of bluebells that grow near our house. 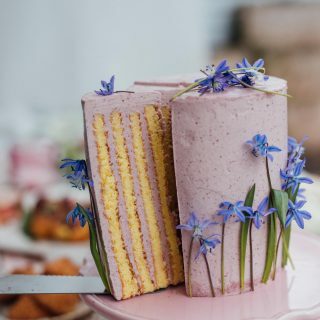 Luckily, they had just started to bloom and I gathered a handful, deciding that their delicate blooms were the only decoration my tall, pink cake needed. 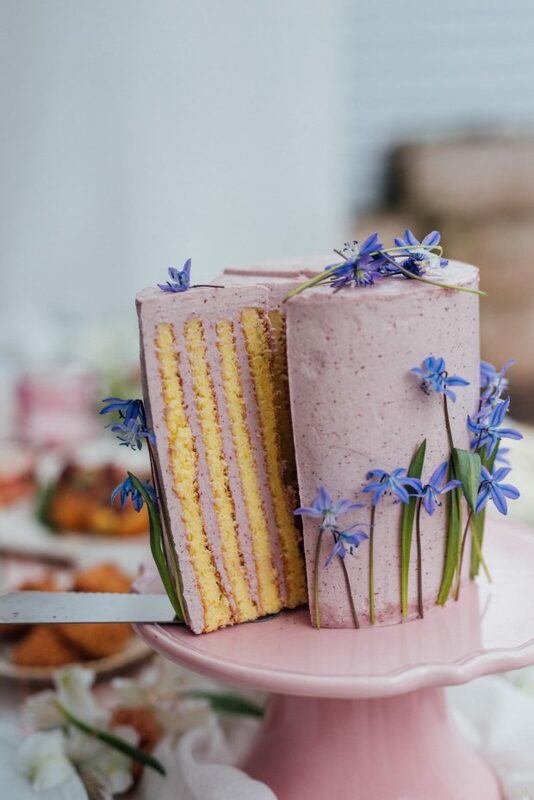 For the petal pink frosting, I use a combination of strawberries and blueberries (both from frozen). I didn’t have black currents, and I was aiming for more of a pastel coloured butter cream. I designed the cake to be slightly taller than the original recipe (about 6 inches total) which made those vertical stripes even more dramatic. I also left off the berry puree drips down the sides of the cake, because I am extremely ‘anti-drip’. I know they have been a cake trend for ages now, but I find that unless they are executed perfectly, they just look sloppy and unappetizing. Of course, feel free to adorn the cake as you like; you could also serve the puree on the side and drizzle it on the slices of cake. The recipe makes a little extra and it is delicious. Of course the real fun is when you slice into this cake, revealing the vertical stripes. It’s quite simply done by rolling the cake up, together with the buttercream, like a Swiss roll and then standing it upright on a cake stand. Its much like a giant cinnamon bun – if there was no frosting on the top, you would see it coiled around and around. 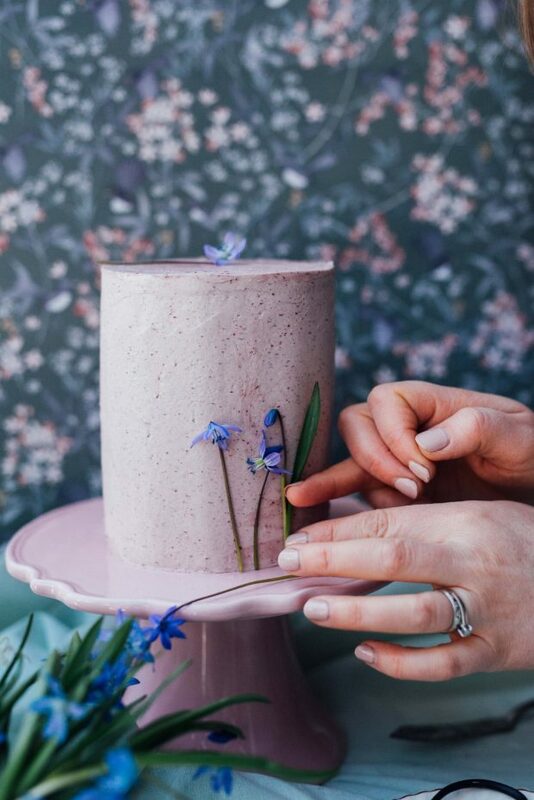 If you’ve read through the recipe, and you can’t get your head around how the whole thing works, there’s a splendid Vertical Layer Cake tutorial over on Brit & Co that shows step-by-step photos of how the whole showstopper comes together. It should make sense after that. I recommend watching Yotam and Helen make the cake together before you get started. Not only it is helpful to see them work through the recipe, but they are so cute together! Last week I shared one of my favourite scone recipes, as well as an advance look at a Royal afternoon tea that a few friends and I threw for fun. If you haven’t bookmarked those Vanilla Cream Scones to make on Saturday morning, then get a batch in the freezer, as I have. Warm scones (as well as Prince Harry in uniform) are perfect incentive for getting out of bed at four in the morning to catch the Royal wedding. 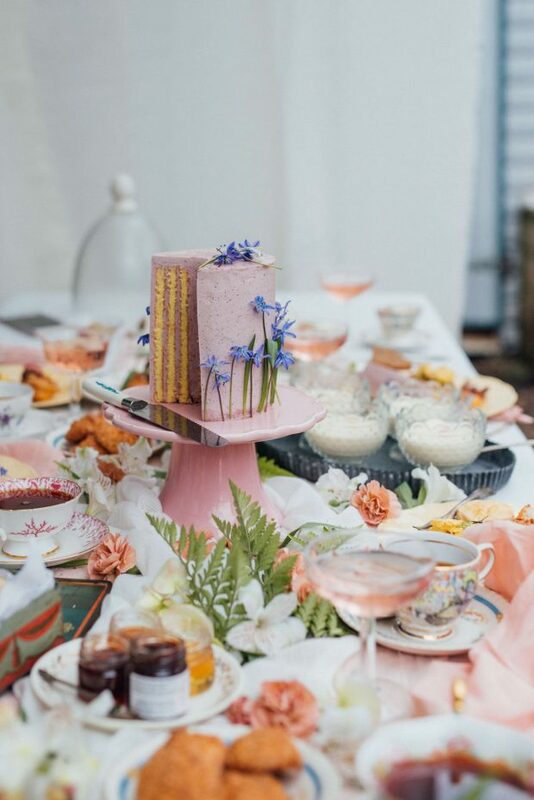 A royal wedding is the perfect excuse to throw a tea party, so why not invite some friends over, bake a cake and steep countless cups of tea. Summer will soon be here with its ultra-casual poolside eats like sticky watermelon slices, enormous burgers and deep bowls of chips. May feels like the last chance to iron a tablecloth and sent an elegant table in the garden before we all quit baking for a few months and succumb to the heat. And as a side note, I tend to avoid playing with buttercream from June to September. It’s just too hot! Besides, summer has so many incredible other desserts like Sour Cream Panna Cotta with Strawberry Compote, Meringue-Topped Ice Cream Birthday Cake, and Muscavado Blueberry Plum Sorbet. Yum. One more thing to note! 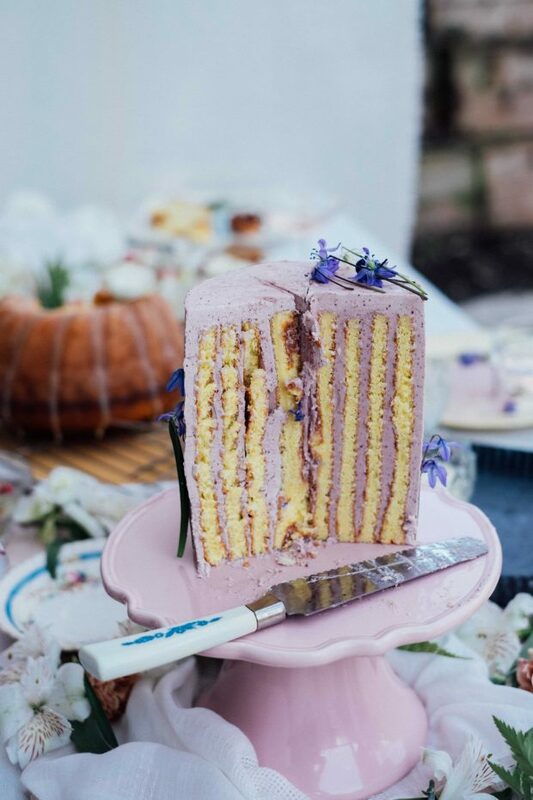 You know I am all about the do-ahead for these recipes, which is why I made this lemon berry stripe cake in its entirety, and then froze it to test how it held up. I defrosted it overnight in the fridge, then let it come to room temperature on the counter for a few hours before I served it. The result? Just as delicious and texturally sound as the cake made and served fresh. So there you go! You can bake and frost it this week, then pop it in the freezer for your Royal Wedding viewing party on the weekend. For maximum flavour, always bring the cake back to room temperature before serving. 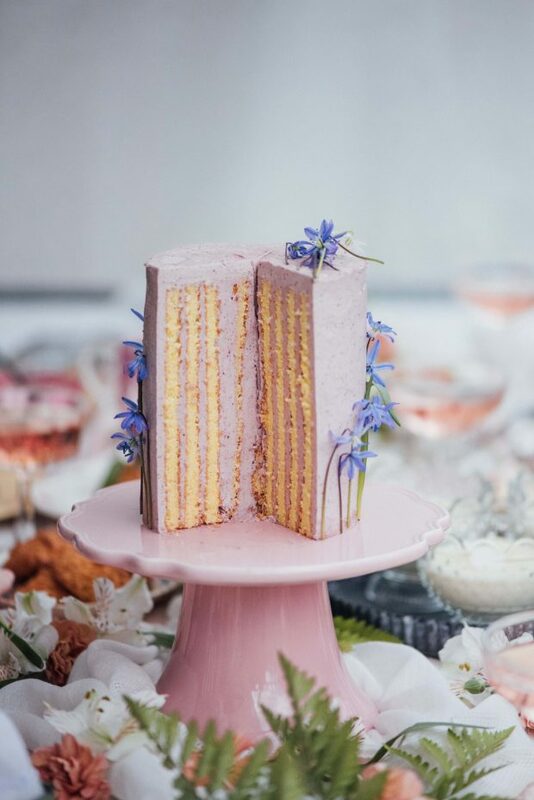 A visually stunning cake, perfect for spring celebrations. Adapted from "Sweet" by Ottolenghi and Goh. 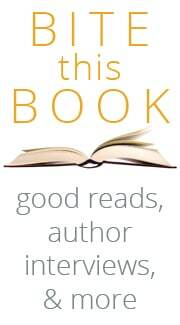 Reprinted with permission from Penguin Random House. Note that my pan size and cuts vary slightly from the original recipe. Place the mixed berries and granulated sugar in a medium saucepan and place over medium-low heat. Cook for for 5-7 minutes, until the berries have softened, the sugar has dissolved and everything has cooked a little. Transfer to a blender and pulse to a purée. Strain through a fine-mesh sieve set over a bowl to catch the purée; you only need 2/3 cup, so save any extra in the fridge for another use. Preheat the oven to 400°F. Line a shallow 12- by 17-inch rimmed baking sheet with parchment paper and set aside. Place the egg yolks in the bowl of an electric mixer with the whisk attachment in place. Add the 2/3 cup plus 2 tablespoons granulated sugar and the lemon juice and beat on medium-high speed for about 3 minutes, until pale and thick. Transfer the mixture to a large mixing bowl and sift the flour and salt directly over the egg mixture in two batches, folding through the mixture with a rubber spatula after each addition. Sprinkle the lemon zest on top and set aside. Place the egg whites in a clean bowl of an electric mixer with the whisk attachment in place. Whisk on medium-high speed until soft peaks form, then slowly pour in the 1½ tablespoons granulated sugar. Continue to whisk until firm peaks form, then gently fold a third of the egg whites into the egg yolk mixture until incorporated. Finally, fold in the remaining egg whites until combined, and then scrape the mixture into the lined baking sheet. Even the surface out with a small spatula and bake for 12-14 minutes, or until light golden brown and a toothpick inserted into the centre comes out clean. Remove from the oven and place on a wire rack to cool in the pan for 5 minutes before dusting the top lightly with powdered sugar. Place a clean kitchen towel on top of the sponge cake and then flip it over so that it is now lying on top of the kitchen towel. Carefully peel away the paper and trim the very edges of the sponge. Starting at the shorter edge of the cake, carefully roll it up (along with the kitchen towel). This is to "train" the cake, ready for rolling up again later. After about 20 minutes, or when no longer warm, unroll the cake. With the short end facing you, measure and cut down the centre of the cake, parallel to the long edge, so that you have two strips, each about 5.5 inches wide. Cover with a clean kitchen towel and set aside. Place the corn syrup, granulated sugar and vanilla seeds in a medium saucepan. 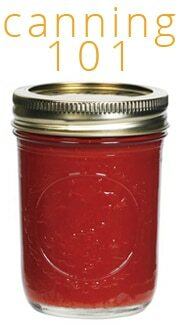 Place over low heat and stir until all the sugar dissolves; this is your sugar syrup. While the syrup is cooking, place the egg yolks in the bowl of an electric mixer with the whisk attachment in place. Beat on medium-high speed until thick and pale yellow in colour. Leave the machine on while you check the sugar syrup; when all the sugar has melted, stir again, increase the heat to medium and simmer until bubbles begin to appear. Swirl the pan gently and continue to simmer until there are large bubbles all over the surface of the syrup. Remove the pan from the heat and carefully pour the hot syrup in a slow, steady stream down the edge of the mixing bowl into the beating yolks. When all the syrup has been added, increase the mixer speed to high and continue to beat the mixture for about 10 minutes, until the outside of the bowl is no longer warm. Gradually add the butter, one cube at a time, allowing it to be incorporated into the mixture before adding the next. When all the butter has been added, scrape down the bowl and continue to beat for another minute, until the buttercream is very smooth and light. Add a scant 1/2 cup of the berry purée and beat on medium speed until fully incorporated. Spread each of the strips of sponge with about a quarter (5 ounces) of the buttercream; this should leave half (about 10 ounces) to frost the top and sides of the cake. Take one strip of sponge and, starting with the short end, roll it up. Once this strip is rolled, position the exposed end at the beginning of the second strip and continue to roll. You now have a rolled cylindrical cake! You should end up with a coiled barrel shape. Turn the cylinder onto the cake stand so that it is standing on one of its flat ends. Spread the remaining buttercream all over the top and sides of the cake, smoothing with a spatula to create an even surface. Chill for 10 minutes to set the frosting, then decorate with fresh flowers or berries. Set aside for 1 hour at room temperature before serving. 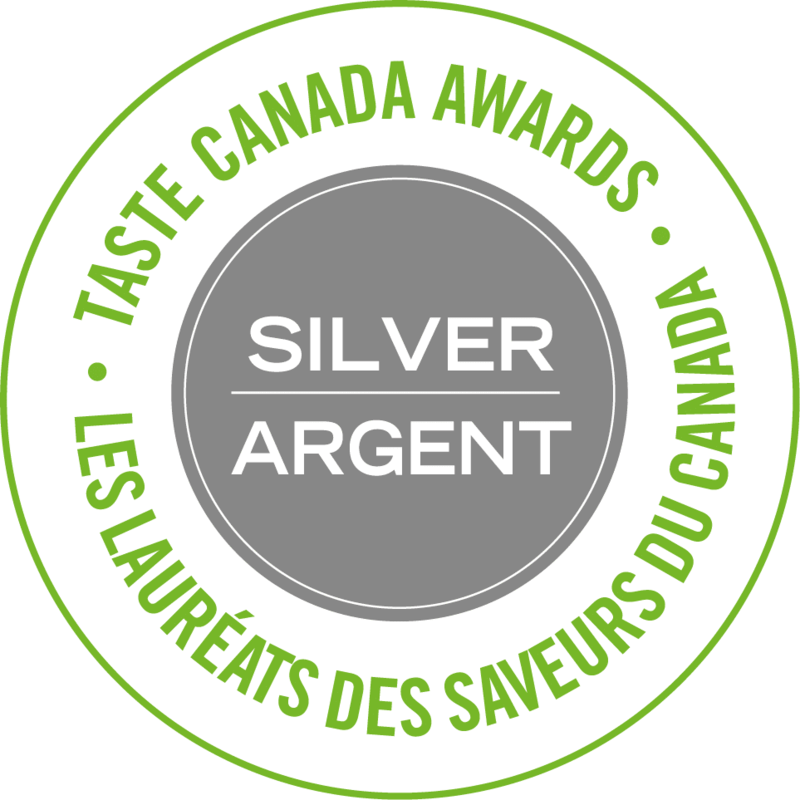 The buttercream can be made up to 3 days in advance and stored in the fridge or freezer. Just bring it back to room temperature and quickly whip it in the electric mixer to restore its fluffiness before spreading. I use a small angled palette knife to smooth out the batter before baking and to spread the buttercream on the cake. This tool works really well for getting a smooth, even layer of buttercream all around the cake. Recipe Copyright ©2017 by Yotam Ottolenghi and Helen Goh. All rights reserved. 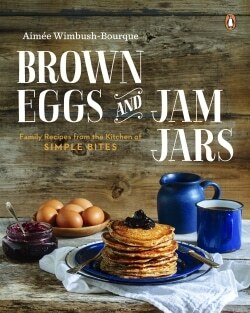 Published in Canada by Appetite by Random House®, a division of Random House LCC. Tell me, friends, will you be watching the Royal wedding on Saturday? I love the Royals, too. I won’t wake up in the middle of the night, but fully intend to watch the highlight reel! What a surprise to see the layers standing up, I’m impressed! I doubt that this lazy baker would attempt something as complicated, but bravo and thanks for the smile. The Royal wedding was amazing! I wish I had seen this recipe in time for it 🙁 . I guess it’ll have to work for Christmas!